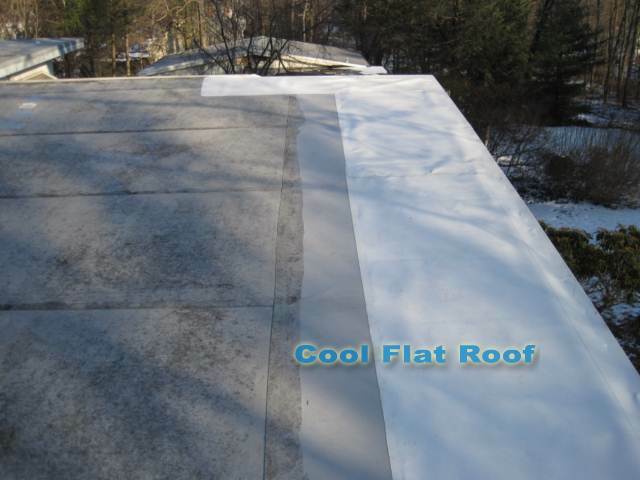 We performed this PVC roof repair in Needham, Mass. in October 2011. This was the second time we repaired this 25+ years old Sarnafil PVC flat roof in the last two years. The first time we fixed this roof was exactly two years ago, in October of ’09 – check out our first PVC Flat Roof Repair overview, which covers this roof in particular, and nuances of repairing old PVC flat roofs in general. In October of 2009, we fixed this roof for the first time. A contractor was doing some fascia repair work there, and threw some tools onto the roof, creating a hole in the old PVC membrane. We repaired it using new IB PVC flat roofing material. First, we cleaned the old roof with warm water (to remove all dirt and small debris). Next, we rubbed it with acetone and a rough brush, to clean the membrane thoroughly, so the new patch would weld nicely. Then, we welded a PVC patch over the hole, which sealed the roof. 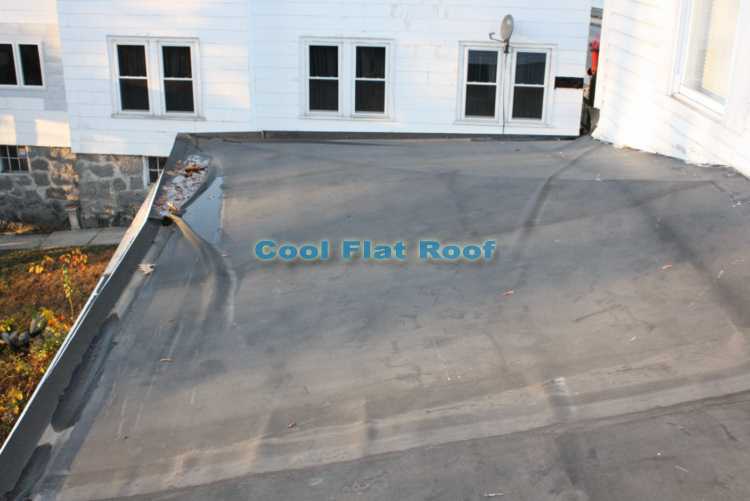 This post is actually an email conversation with a customer, regarding Tapered Insulation and our flat roof installation in Cambridge, MA done in the summer of 2010. This email conversation is posted as is with the customer’s permission – the only editing on this post was done to remove any personal information, and spelling :). 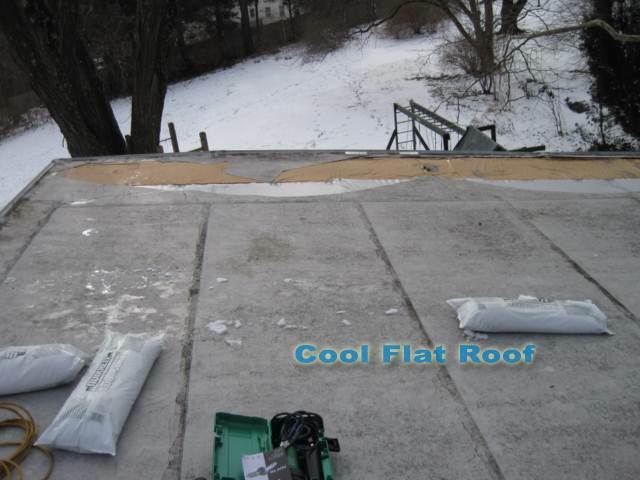 I thought this would be helpful to our readers, who are interested in tapered insulation and/or have ponding water problems with their flat roofs. With economic strife on the rise, it has now become necessary to seek out ways to save money, as well as to find ways to “stay green”, and to do what you can to help the environment. Unfortunately, accomplishing both at the same time seems to be very difficult. Believe it or not, there is a smart, fairly simple, and very efficient way to succeed in these two areas in a way not often looked upon as a money saver, but rather a necessary and costly project when it doesn’t need to be; the roof. When you really get down to it, the roof is either costing too much, or saving plenty. 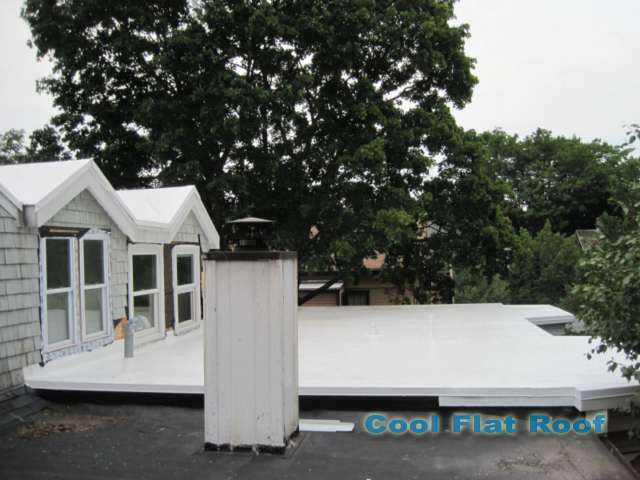 We installed this flat roof near Harvard Square in Cambridge, Massachusetts in the summer of 2010. The installation consisted of four separate roof sections on different levels of this house, which at the time was undergoing major renovations inside and out, including total new insulation in walls and between roof rafters, a new heating system with radiant floor heat, new energy efficient windows, and a new IB PVC flat roof (which we installed of course). The old rubber roof was leaking and we had to remove it, including the wet roof insulation. We installed a new 50-mil white IB Flat Roof, with 4 inches of tapered insulation (4 inches at the highest point and 1 inch at the lowest level). The tapered insulation system was utilized to eliminate ponding water on the two bigger sections of the roof. At the deepest point, there was as much as 2 inches of ponding water, and a puddle with at least 12 feet diameter. This ponding water caused both roof leaks and the roof rafters settlement. TPO Roofing – Is it Good Or Bad For the Roofing Industry And Building Owners? Recently, the MRCA (Midwest Roofing Contractors Association) issued a warning bulletin regarding TPO roof failures caused by the sun’s UV rays. You can read more about it in our original TPO Roofing page, as well as my commentary on this bulletin. At the same time, major roofing distributors are shamelessly pushing TPO into the market and onto the roofing contractors without much regard for home and building owners. Bear in mind that because of low prices and “same cool roof” and “welded seams” qualities as PVC roofing has, TPO is now the fastest growing commercial roofing product. Here is a good example – pictures below will show you “manufacturer’s” stand showing a TPO roof designed for residential roofing contractors. Why residential roofing contractors? Well, the way I was told, these are the roofers who can’t afford to spend $12,000 on hot-air welding equipment, so the roof manufacturer created a system that would allow these guys to jump on the TPO band-wagon. Here comes the best part! This TPO roof system is put together with … no, not hot air. Seams are primed and a seam tape is used to seal overlaps! 😀 But, it gets better – since there is no uncured flashing material in the TPO world, and these “shingle-bangers” don’t have Liesters (hot air welders) nor do they want to buy them, since the cheapest one – a hand welder – is $450 before tax. 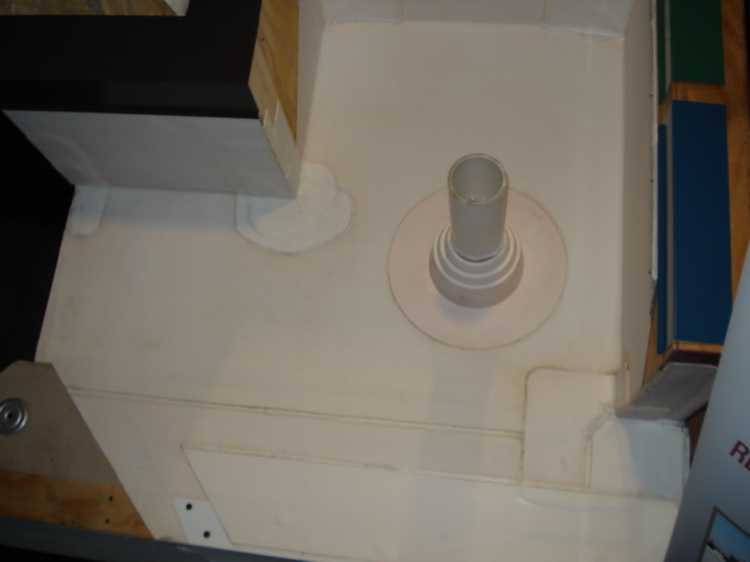 So, this manufacturer uses white EPDM uncured flashing for all detail work such as inside / outside corners, posts, curbs (skylights, chimneys, roof hatches, HVAC equipment, etc.). EPDM rubber on TPO – really? Green Roofing Contractors – How Are We Different From Other Roofers? The term “green” has become very popular during the last decade and consequently overused, misused and abused. Anything and everything can be called “green” today. To make money and to attract environmentally-conscious customers, people will call themselves and their products “green”, even when it is just a blatant lie to confuse uneducated consumers. Being a roofing contractor, I will concentrate on roofing products and services. For example, many asphalt shingles manufacturers now offer “cool” and “green” shingle products – to me it’s just a shameless tactic to sell the same NOT-GREEN crap that is painted A different color (usually some shade of white). Excuse me, but asphalts shingles are not green, period! TheY are made with asphalt, can’t be recycled and end up in landfills in 10-15 years. Since the term green is very vague and can be interpreted in many ways, I’ll offer my vision of “green” – a green roofing contractor to be exact, which describes the way I think and try to operate our roofing business. I want to mention that when I say “green roofing contractor”, it has nothing to do with with a roofing contractor installing green roofs or roof-top gardens. To me a contractor installing roof-top vegetation is a highly-specialized landscaping company, but not a roofing contractor (unless they also install the actual flat roofing membrane to waterproof the building). What is a “green” roofing contractor and how one is different from regular roofing companies. What is a “green” roofing contractor? Replacing an old rubber roof with IB PVC roofing membrane in Lowell, MA. In the beginning of Dec. 09 we installed a new IB PVC roof in Lowell, MA. This roof replaced an old EPDM rubber roof, which was installed by a hack roofing contractor about two years ago. The roof was failing miserably, due to two factors: poor roofing system design on the part of EPDM, and a horrible installation job by the contractor. I suspect that this contractor had almost zero knowledge about flat roofing and rubber installation. Before I go into the IB roof installation, I want to talk a bit about the two factors mentioned above that contributed to the roof failure. The roof actually consisted of two sections not connected to each other. One smaller roof in the front of this historic home was about 100 sq. ft. in total, but its shape made using a rubber roof not feasible due to limitations / flaws of rubber roof system design. Another roof section was just over 300 sq. ft. and covered an enclosed porch in the rear of the house. This section had a low slope (about 2 in 12 pitch) and a hip roof design. The failure of both front and rear roof sections was the result of bad installation by the roofing contractor, EPDM membrane’s shrinkage, as well as seam adhesive failure. As you may know, we specialize in the installation of IB roofs – premium grade PVC flat roofing membranes, with fusion hot-air welded seams, which ensure permanent lap bond, and as a result, leaks-free performance. At the same time, if you have a rubber roof, which is in fairly decent shape, but has developed some leaks due to lap sealant (epdm rubber glue) failure, we can repair it fairly inexpensively, as compared to installing a new IB membrane, and extend the service life of your rubber roof. 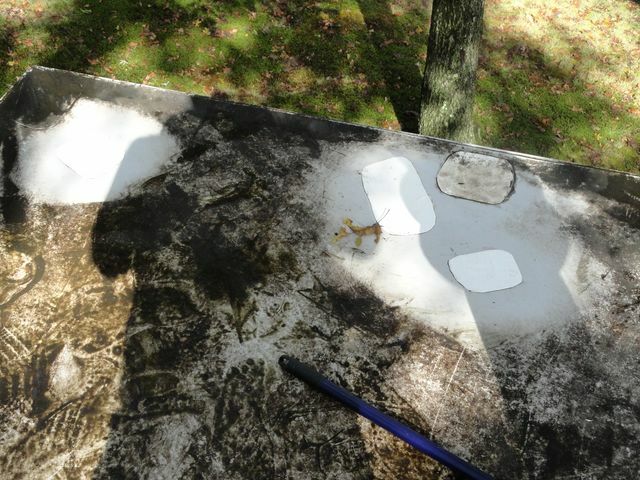 Learn more about our rubber roof repair services in MA, CT and RI. We want you to know that although we repair rubber roofs, we will not install one, because for us it is an inferior roofing material with too many limitations and extremely high probability of developing leaks. Here we will explain you how these repairs work and what you can expect, as well as show a few roof repairs in Massachusetts, which we have done recently. We also recommend that your read our Rubber Roofing guide, which explains the shortcomings of rubber roofs, and why we advise home owners to stay away from EPDM rubber roofing systems due to product limitations and an overwhelming number of dishonest roofing contractors eager to install rubber roofs, without proper knowledge of this system. Instead, we recommend installing IB Flat Roof – a PVC single ply flat roofing system with hot-air welded seams, which will not break down, as rubber roof seams tend to do after 5-7 years.